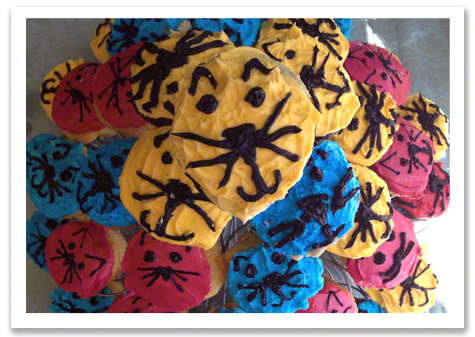 A few months ago I got an email from a cat-loving friend of Covered in Cat Hair who lives in Rhode Island. She told me that she wanted to help out Kitten Associates, but didn't have a lot of resources to make a donations. 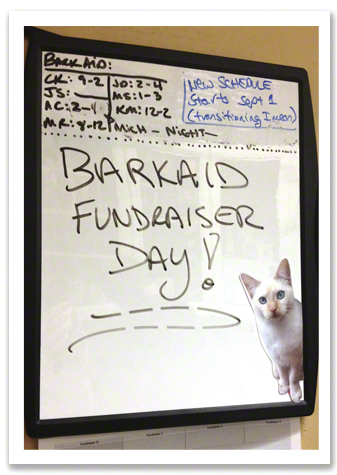 Instead, she told me about a program called BarkAid  and suggested I contact the Founder, Patrick Lomantini, and ask him if Kitten Associates could be part of his fundraising efforts. BARK. AID? Isn't that for dogs? 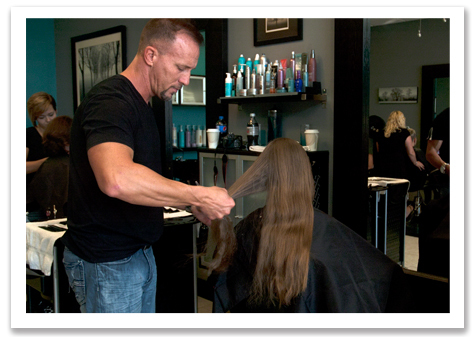 Patrick owns Lomantini the Salon  in Wichita, Kansas. He loves animals even though he couldn't have one as a child AND he's somewhat allergic to cats. He wanted to make a difference helping animals in need, but didn't want to focus just on his local rescue. 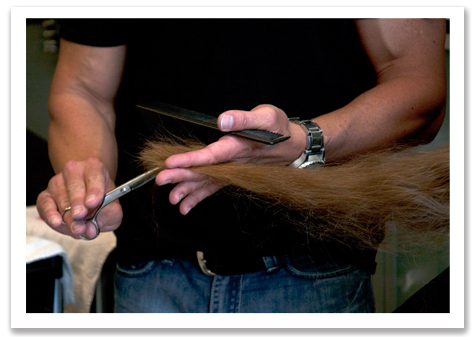 Sure, he could do a cut-a-thon, something he'd done in the past, but it would only help one rescue. It wasn't enough. 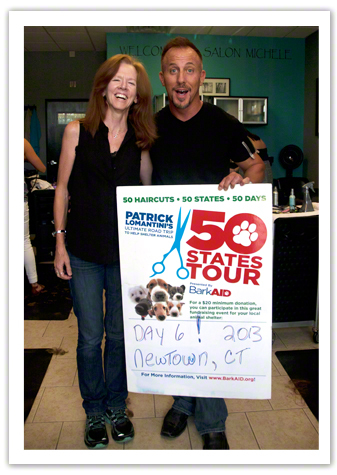 Three years ago, Patrick had the crazy idea to get in his car and travel to one state per DAY, team up with a local salon, cut hair for 12 hours and charge just $20/haircut. At the end of the day he'd donate the money to a local rescue group. Yes, it's nuts, but Patrick is a physical specimen of manly hunkatude who can handle the challenge he set for himself. His 6-pack abs have abs and his biceps would make Popeye blush. Patrick has close-cropped hair and wears tight black t-shirts and jeans, with a big hunky watch. His blue eyes could charm anyone he meets. There's a bubbling energy about him that's contagious, which won him over with folks as he blazed a trail across the country. Patrick decided he had 50 days to accomplish his mission and somehow he pulled it off. What is more impressive is that he decided to do it again the next year and again this year, with a small team of volunteers at his side. Patrick NEEDS a big, fat corporate sponsor for these events, but right now Patrick is paying for the trip out-of-pocket. He wants each rescue to get as much money as they can, so he donates 100% of his profits to them, only asking for tip money to go to the volunteers to pay for gas (last year was $6,000.00 alone) and food. He hopes that the rescue groups will be able to put his team up for the night, too, to help offset costs. ©2013 Robin A.F. Olson. Zach, Patrick (Center) and Alexis. As fate would have it, just a I was contacting Patrick to ask him if Kitten Associates might take part he happened to be looking for a rescue group to work with in Connecticut. Apparently he hadn't had the easiest time here and was hoping for a better match this time around. I told him we're a TINY rescue and that there are bigger ones in town that could do a lot more, but Patrick had faith in us and said that the smaller rescues always worked a lot harder to publicize the events and support his team. I figured I'd give it a try IF I could secure a salon for his team to set up shop. My first and only choice was Salon Michele , where I get my fancy-pants hairdos from time to time. I ran the idea past Maggie, who has been doing my hair for a few years now. She is a cat lover, so it wasn't tough for her to say YES. Of course we had to ask the owner, Michele and I realized it would be basically asking her to shut her salon down for the day and let me use it to raise money. Thankfully the date they chose for us was a Tuesday, so it was a slower day for business which might make it easier to give us the green light. I gathered all my info and presented it to her. She didn't take long to think about it and said YES! From that moment on was a whirlwind for me. I had to do a lot of planning, getting permits to put out directional signs, finding out how to get a 25-ft long banner hung over the main street in town, making list after list of what needed to be done, who needed to be told. I struggled with how to get the word out and my dear friend Mary Shafer of Word Forge Books  helped me get the Press Release sorted out. 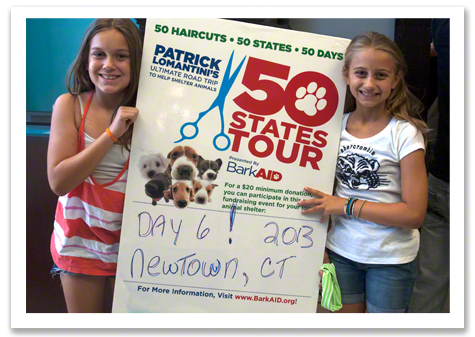 For two months I was obsessed, but my biggest challenge was HOW to explain this event and NOT have people think that it was either Haircuts for DOGS or a fundraiser for DOGS? I got everything sorted out and spent a lot of late nights working on this. I began to realize right away that we'd have to spend a good deal of money on advertising-YES, not just doing free ads online. Our town paper, The Newtown Bee , was the key way to get the word out to everyone in town. After all, we are the hometown cat rescue and we knew they'd help us. As luck would have it, an ad space opened up that was PRIME location and it hit the streets a few days before our event. I worried about spending $450.00 for this huge ad. It would be on the front page of The Bee Extra, The Bee's free paper, as well as inside their main paper. I had to take a risk. If we couldn't reach people, what was the point? I was very glad my graphic design background came in handy. 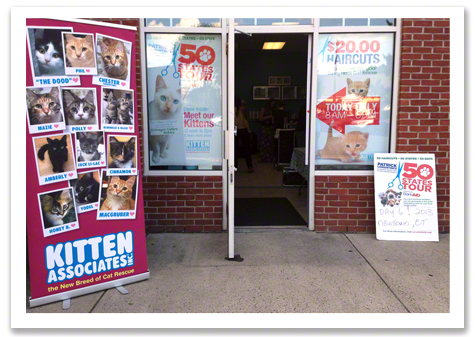 I put together designs not just for flyers, but for table top signs, HUGE window signs that would re-skin Salon Michele, directional signs and a twenty five foot long banner-the biggest piece I've ever designed. It also dawned on me that this is something I was meant to do. When I was a kid, I put on plays for my parents, then when I was at school, I was in Student Government where I came up with events like "Bring your Camera to School Day." In High School and College I took it up a notch and planned big events. My pride and joy was a 1940's Prom with a big band for over 600 guests. Why couldn't I do a fundraiser for my own rescue group? Because I had to take care of RESCUES, too! I was having all sorts of stress dreams. The worst was the morning of the event, I dreamt I was waking up with most of my hair laying on the pillow and no way to hide that I was bald. ©2013 Robin A.F. Olson. Beth, one of our awesome adopters with Patrick. 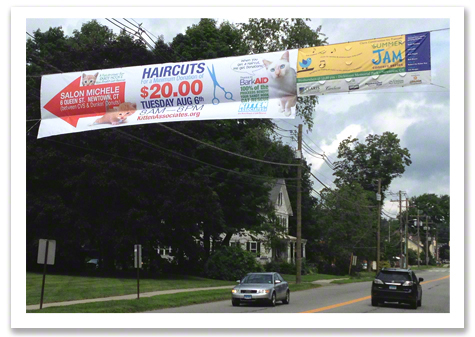 When the banner was hung and the ads were printed, I knew I'd spent about $1000. and that was about half of all the money we had. I started to fear we might lose money, but my friends kept reminding me that getting our name out is valuable, too (tell that to the Vet when he wants to be paid!). Kathy, the super-star who works the front desk of Salon Michele contacted me and said we had 3 appointments for haircuts. My heart sank. We had one week to go and I worried not only would we lose money, but it would be embarrassing to everyone who gave up so much to support our group. A few days later the banner was hung and more calls came in. We were up to 14 appointments, which was still far too few. We needed 50 to break even. The Friday before the event, the big ad in the paper came out. Nothing happened for three days, then on Monday, the day before, we were up to 50 and rising. Between the banner, the ad and word of mouth, things were heating up. By Tuesday I knew we had over 60 with whispers that it might even go higher than that. ©2013 Robin A.F. Olson. 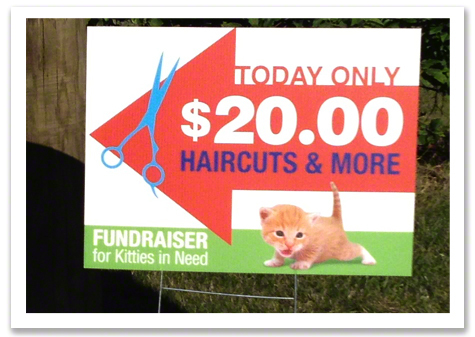 Busy Bees cutting hair and raising money for our kitties! 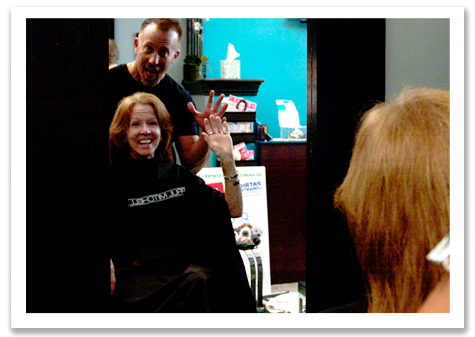 Tuesday morning, the BIG DAY, I drove over to Salon Michele to get set up. It really hit me that a lot of people had stopped what they were doing to help Kitten Associates and most of them I didn't even know. I fought off crying, but it was very emotional. When you work really hard and often have difficult situations to deal with, you don't have time to think about what you might get out of it. 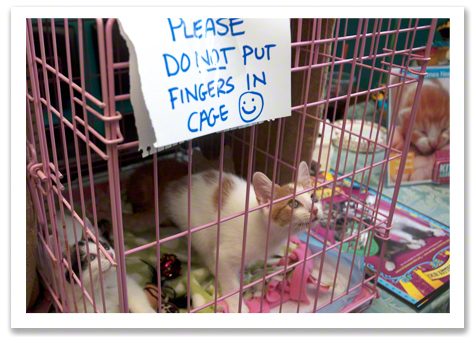 With cat rescue it's just focusing on helping the cats however you can. You know there are lots of people who love cats, but they wouldn't get their haircut because of that, would they? ©2013 Robin A.F. Olson. 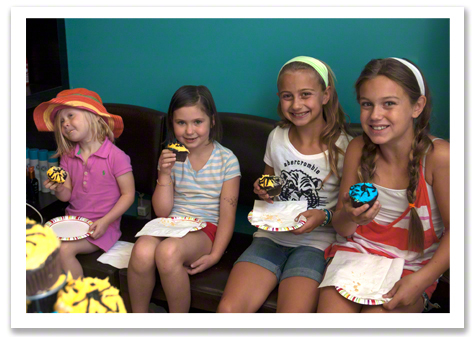 These cupcakes from the DOrazio Sisters Bakery tasted SO GOOD that I am craving one or ten right now! So I got to work. Patrick and his team were already there even though the first appointment wasn't for 30 minutes. They'd arrived at 1am and were already back up and ready to go at 7:30am. These guys were amazing and they hadn't even started! While I set up, everyone got to know each other. Zach, one of the stylists graciously helped me put out the directional signs at the perimeter of the parking lot. We got chatting and he told me this was the first time he'd been east of Montana and that his home state was Idaho! I couldn't begin to imagine how amazing and exhilarating it was for him to see so much, in so little time. What a wild ride. I was tempted to offer to join them. Alexis, one of the other stylists, offered to do something with my hair. It was really kind of her to help me look less like a mop and more professional, plus it was just plain fun to get fussed over after all the weeks of preparations were finally over and I could (sort of) relax. Then, as they say, the rest is a bit of a blur. 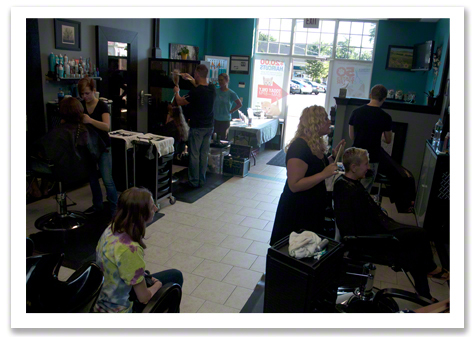 People were coming in, a few almost begging for appointments, we were filling up to the point of having to turn people away! From 50, to 60, to 70 haircuts. The day raced by. I answered a lot of questions about cats and around noon, Sam brought three of our kittens to remind everyone why we were there. They did great and had a lot of fun. Everyone wanted to take them home, but Irene, my faithful friend and volunteer, kept a watchful eye over them so none of the kitten “accidentally” left the salon. ©2013 Robin A.F. Olson. 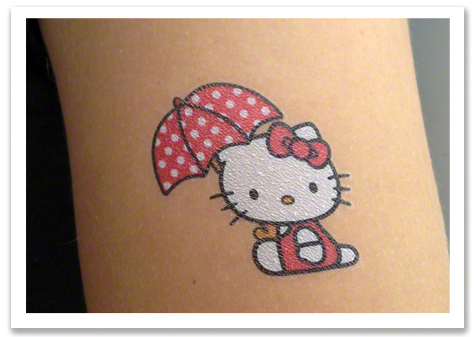 It's not a party unless you have tattoos! I was really hungry. Our friends, the DOrazio Sisters  from Brooklyn who opened a bakery here in Newtown, kindly and generously donated 4 dozen cupcakes. 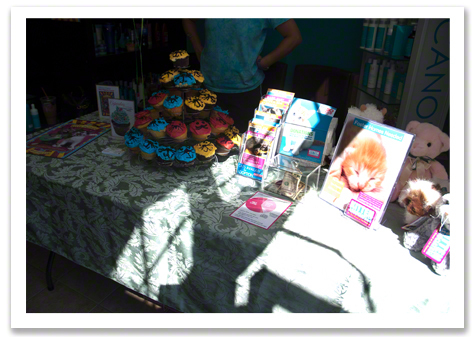 We had them set up on a lovely cupcake tower stand and it was tough not to eat them ALL. I managed to sneak one..okay two, but no more than three, when no one was looking. I still have a jones for another one! It was clear we were going to do okay. Somehow amidst the chaos, a lot of people were getting really nice haircuts. 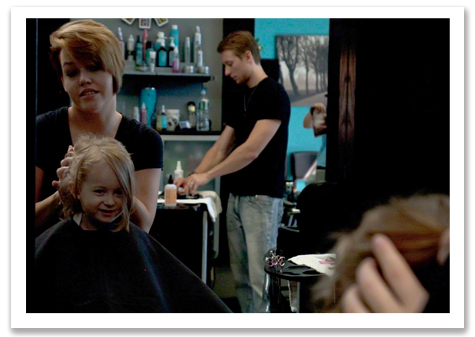 One lady donated her hair to Locks of Love, which really touched my heart. Another lady talked about being at the Sandy Hook Elementary on "that day" and I think it helped her with the healing process to have Patrick fuss over her and listen to her heartbreaking story. We had lots of kids come visit, too, who told me stories about their cats or other pets. Even though I've lived in Newtown for over 20 years, it honestly was the first time I felt like I was part of this community. Not having children, I never had need to go to any of the town events or schools. I've yearned to feel closer to the people in this town and surprisingly, that finally started to happen because of K.A. 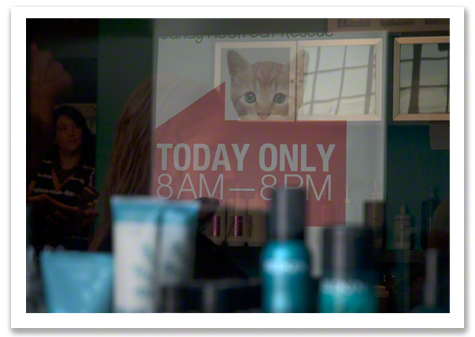 Kitten Associates is on the radar of more people in town. It was definitely a dream starting to come true. 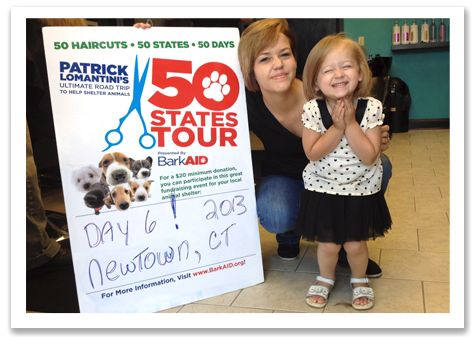 In total, Patrick and his team, as well as Maggie, Michele, Jackie, Mary, Kathy and others from Salon Michele helped get 84 haircuts done, which was the SECOND HIGHEST number of haircuts in BarkAid's 2 1/2 year history! I was really really REALLY thrilled! 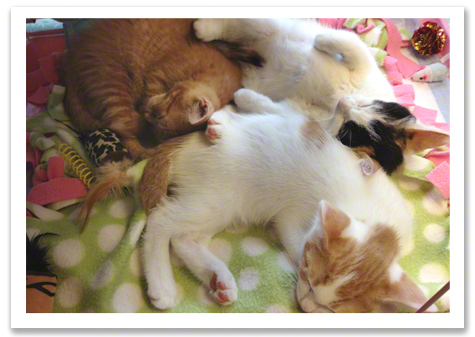 We were able to cover our expenses and the rest will go to caring for our kittens. ©2013 Robin A.F. Olson. 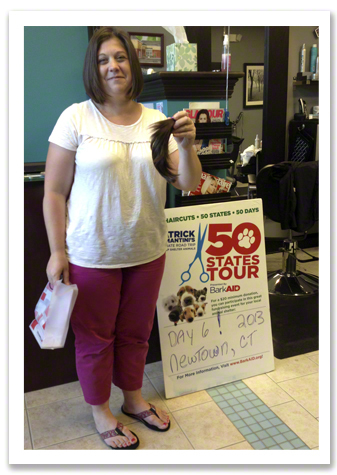 A donation for Locks of Love! What a wonderful woman! By 8pm we all pitched in, packed up, cleaned up and were ready to call it a day. 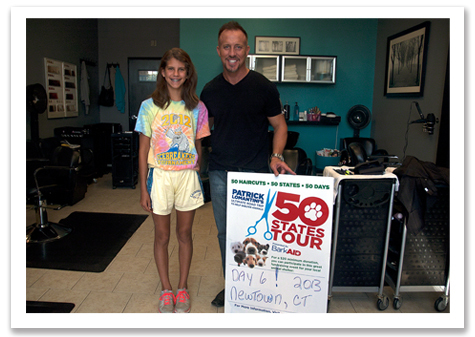 Patrick and team were professional, friendly, outgoing, charming, everything good. Thankfully Michele's salon wasn't trashed. It was respected by all and I think that we all parted with genuine smiles and goodwill for each other. Patrick said he was ready to do this again next year, as he hugged me goodbye. I just shook my head, wondering how he does this, because I wanted to go to bed and not get up for a few days I was so tired. In lieu of a proper photo album, enjoy some images from our big day! ©2013 Robin A.F. Olson. Michele, owner of Salon Michele giving a great haircut and big smile to a customer. ©2013 Robin A.F. Olson. Patrick hones his craft. ©2013 Robin A.F. Olson. Ruby steals the show. ©2013 Robin A.F. Olson. The team with Minnie's kittens: Gracey, Mellie and Joey. ©2013 Robin A.F. Olson. Zach and Gracey. ©2013 Robin A.F. Olson. How to know it's time for the kittens to go home. What an absolutely fabulous story - and a wonderful guy with a great idea. All that organising paid off Robin but you must have been exhausted. How's your new hairstyle? The kittens looked very calm and comfortable being handled and I'm glad Minnie is on the mend.